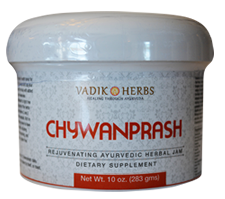 Chyawanprash is the most famous rejuvenating Ayurvedic tonic in India. 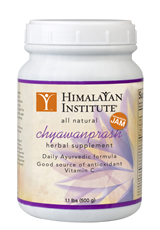 Chyawanprash has the consistency of jam and contains 20-80 herbs and spices, including the all important tropical gooseberry, Amla (Embellica officinalis), the world's richest natural source of vitamin C. It works on the immune system by protecting the body against everyday infections that cause coughs, colds, and fevers. It can be used by children, old persons, tubercular patients, and debilitated persons. It is a superb antioxidant and free radical scavenger. Contains: standardized extracts of Indian gooseberry (emblica officinalis), Guduchi (Tinospora cordifolia), Shatawari (asparagus racemosus), Udakiryaka (caesalpinia digyna), Arjun (terminalia arjuna), Japa (herpestis monniera), Shank Pushpi (evolves alsinoides), Ashwagandha (withania somnifera), Bilwa (aegle marmelos), clerodendron phlomidis, Shyonaka (oroxylum indicum), Gunbhari (gmelina arboria), stereospermum suaveolens, Bala (sida cordifolia), Dhatura (desmodium gangeticum), uraria lagopoides, phaseolus tribbus, termanu labiais, Indian Long pepper (piper longum), solanum indicum, Kanta Kari (solanum xanthocarpum), Pistaceo (pistacia integerrima), Bhumy Amalaki (phyllanthus niruri), Draksha (vitis vinifera), Haritaki (terminalia chebula), hedychium spicatm, Musta (cyperus rotundus). Contains: Amla fruit (Phyllanthus emblica), Indian Kudzu root (Pueraria tuberosa), Long Pepper fruit (Piper longum), Mysore Cardamom seed (Elettaria cardamomum), Malabar nut tree leaf (Justicia adhatoda), Spanish Pellitory root (Anacyclus pyrethrum), Arjuna bark (Terminalia arjuna), Ashwagandha root (Withania somnifera), Shatavari root (Asparagus racemosus), Bacopa leaf (Bacopa monniera), Holy Basil leaf (Ocimum sanctum), Terminalia chebula fruit (Terminalia chebula), Ginger rhizome (Zingiber officinale), European grape fruit (Vitis vinifera), Licorice root (Glycyrrhiza glabra), Sacred Lotus flower (Nelumbo nucifera), Jatamansi root (Nardostachys jatamansi), Neem leaf (Azadirachta indica), Tribulus fruit (Tribulus terrestris), Bael fruit (Aegle marmelos), Indian Tinospora stem (Tinospora cordifolia), Phyllanthus herb (Phyllanthus niruri), Zedoary rhizome (Curcuma zedoaria), Cyperus rhizome (Cyperus rotundus), Indian Elecampane root (Inula racemosa), Heart Leaf Sida root (Sida cordifolia), Himalayan Pistachio fruit (Pistacia integerrima), Leptadenia leaves (Leptadenia reticulata), Boerhavia root (Boerhavia diffusa), Fig (Ficus carica), Clove bud (Syzygium aromaticum), Cinnamon bark (Cinnamomum verum), Indian Cassia leaves (Cinnamomum tamala), Mesua flower (Mesua ferrea), Saffron stigma (Crocus sativus) with Sugarcane (Saccharum officinarum), Clarified butter (Ghee), Honey, and Sesame oil. Contains: standardized extracts of Emblica officinalis, Tinospora cordifolia, Asparagus racemosus, Caesalpinia digyna, Terminalia arjuna, Herpestis monniera, Evolvulus alsinoides, Withania somnifera, Aegle marmelos, Clerodendron phlomidis, Oroxylum indicum, Gmelina arborea, Stereospermum suaveolens, Sida cordifolia, Desmodium gangeticum, Uraria lagopoides, Phaseolus trilobus, Termanus labialis, Piper longum, Solanum indicum, Solanum xanthocarpum, Pistachia integerrima, Phyllanthus niruri, Vitis vinifera, Terminalia chebula, Hedychium spicatum, Cyperus rotundus. Contains: A properietary mix of: Indian gooseberry** (free fruit rind),Unrefined sugar, Clarified butter (milk), Honey**, Piper longum (fruit), Cinnamomum zeylanicum (bark), Cinnamomum tamala (dried leaves), Ellataria cardamomum (fruit), Mesua ferrea** (anthers). Extracts of Asparagus racemosus (roots), Tacca aspera** (rhizome), Ipomoea digitata** (rhizome) Withania somnifera (roots), Piper longum (fruit), Ellataria cardamomum (fruit), Oroxylum indicum** (bark), Solanum indicum (stem & root wood),Tinospora cordifolia** (stem), Terminalia chebula** (fruit), Apocynym foetidum** (whole plant), Boerhaevia diffusa** (roots), Phyllanthus niruri** (whole plant), Adhatoda vasica** (whole plant except roots), Aegle marmelos** (bark), Premna integrifolia** (wood), Gmelina arborea** (bark), Stereospermum suaveolens** (bark),Desmodium ganeticum** (leaf and tender shoots), Uraria lagopodies** (bark), Nelumbium speciosum** (flowers), Solanum xanthocarpum (whole plant), Tribulus terrestris** (fruit), Gymnema sylvestere** (whole plant), Curcuma zedoaria** (rhizome), Pistacia integerrima** (galls), Cyperus rotundus** (rhizome), Vitis vinifera (fruit).